A4 Adult 5" Cooling Performance Shorts. 100% Polyester Interlock. Moisture Wicking. Odor Resistant. Stain Release. 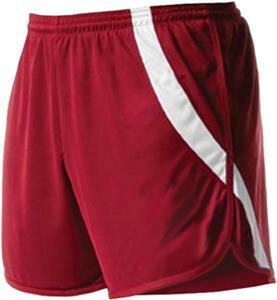 Running shorts with side vents. Contrast inset detail. 1 1/4" waistband with cord. Matching inner brief. Ultra tight knit resists snagging. WAIST 28"-30" 30"-32" 32"-34" 34"-36" 36"-38" 40"-42" 42"-44"
Quality product for a great price! Loved the shorts/the price, very comfortable fitting, also enjoyed the different colors as well. Thanks.